Many townsfolk rush back to their homes and close the shutters, hoping that the destruction was only a nightmare. 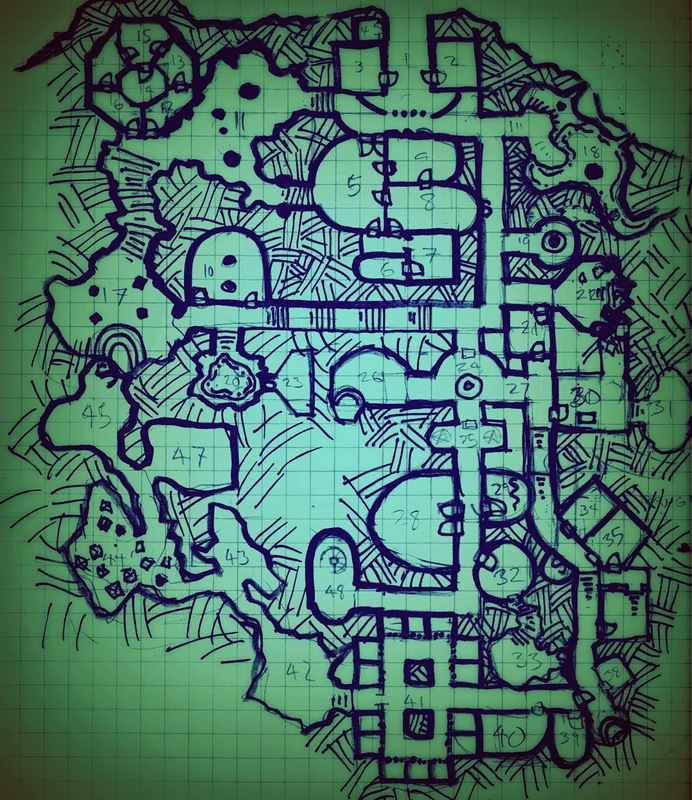 A few do not, and an impromptu exploration party consisting of a local 4’ marten forester, a young valkyrie, a gangly student sorcerer, a badger priest and a pair of human soldiers march towards the smoking and crumbled castle, now silent except for the occasional sound of a falling rock. Leaving the poor crustacean to stumble back to Bobble, the adventurers, heads filled with dreams of wedding plunder, press on to the castle’s gates, to find that the living oaks of the main gates are closed, a tangled and impenetrable wall of animated tree limbs, bathed in oily sulfur colored light, that seeps between the cracks and spreads across the earth before the menacing trees. The Marten attempted to enter the yellow glowing areas around the gate, but immediately began to feel nausea and soon coughed up a pair of fat jaundiced slugs. With the gates barred and the oily glow itself a danger, the party began to circumnavigate the bluff seeking another entrance to the castle. As a local The Marten knew of an entrance through the rock itself, the ancient white stone pilgrims’’ way leading to the Earth Goddess shrine beneath the castle, where Queen Azure gave her oracular wisdom to visiting scholars. The white stone were unaffected by the dangerous glow and the party found the shrine entrance uncluttered except for a sign that read “Shrine Closed for Wedding – Danger, Area Patrolled by Beasts”. Beyond was a natural cave, stalactites still dangling from its ceiling with the walls and floor polished and carved with relief of stern elven warriors. The shrine entrance was dangerous, as the Forester discovered, entering and triggering a dart trap. Luckily the dart missed, and when recovered proved to be more for show then real injury. A portcullis of carved stone spikes prevented further progress into the shrine and the party began to investigate two side chambers. The first contained a pair of elven guards in ornate parade armor covered in brass and silver filigree and polished decorative stones. The guards were not well though, their eyes, mouths and ears leaked a dull shining metallic sludge and their flesh looked almost as if it had been cooked from within. Lunging at the valkyrie as she opened the polished stone door, one of the guards caught managed to penetrate her armor with its decorative silver halberd, before the pair were overwhelmed. The metallic sludge proved to be molten lead, and the unfortunate guards bodies were full of it, with the molten metal slowly cooking them from within – a fell and evil curse. Collecting the largely decorative weapons and armor as treasure the party remarked on a lever at the rear of the chamber in the up position. Otherwise the small guard room contained only a few benches and a burnt out light crystal lamp. Listening to the other door to avoid attack by more cursed guards, the party heard skittering and a chittering noise, and the Valkyrie prepared an oil bomb. Flinging open the door and hurling the bomb into the small stone room, she caught a quick glimpse of a furry beast with a huge fluffy tale before slamming the door. Opening the door after a second, the guttering oil flames revealed a giant squirrel wearing a small painted saddle fleeing out through a small high window in the rock. The Marten scurried up the wall after it, but the squirrel escaped into the treetops. Lever and simple benches were repeats in the room, and the party was smart enough to flip the lever up with a pole, as close examination revealed tendrils of yellow glowing sludge that had crept into the handle through the rock. Flipping the lever caused the portcullis to lift and opened the wear deeper into the complex’s smooth polished brown and grey stone corridors. Almost immediately the party discovered a pair of nicely made oak doors with a book engraved on them. Behind the book doors was a library, but it had been ransacked, and the plunderers were still present. A quintet of lead oozing scholars: a big bald man, an elf, a hedgehog, a rabbit and a gnome. Thrown daggers, axe blows, swords and maces take down the benighted scholars, but not before the badger priest ends up with a few nasty gnome bites to his leg. Searching the library the adventures discover a large collection of books on geomancy and similar earth magic related subjects, though many of the best works have already been shredded or burned by molten lead. Choosing to plunder the library later, the band presses on through on of the library’s many doors discovering a hostel for wandering scholars complete with beds and a set of wooden lockers. The hostel is occupied by a lead cursed human wizard, his red velvet robe covered in embroidered symbols now singed by the leaden vomit dripping from his beard. The enchanter is aided by a band of five mercenary soldiers, also afflicted with the curse and the party quickly joins them in battle. It should have been a tough fight, but the guards burst into the room and are cut down by the party fighters, with the Marten plunging one of the gate guard’s leaf shaped silver short swords into the back of the first cursed mercenary through the door. On the corpses the adventurers discover several small keys and the wizard’s travelling spell book, which their own conjurer quickly takes and begins to flip through. The keys of course open the dead mens’ lockers revealing musty travelling cloaks and cheap camp gear. Only the red wizard’s own, slightly nicer, leather satchel has anything of value, a red silk scarf and an egg of engraved turquoise. Moving South from the hostel sleeping area through another polished wood door, the adventurers discover a well-lit dining hall, with a massive feast set on its 20’ long banquet table. Murals on the walls depict robed scholars dining with humanoids made of crystal in some sort of idyllic feast. Close inspection reveals the food is cold, and more strangely, even the meat dishes are cleverly disguised vegetables. As they explore the room and wonder at the feast, the party hears snatches of creepy elven song coming from the kitchen. Preparing a trap of spilled wine, and a hanging bundle of food, attached to the chandelier, the party calls into the kitchen for desert. Unexpectedly they are answered in thick, blubbering elvish, with a promise of more wine. Soon a drab human woman, a changeling trapped in the fey world to toil for her elven masters, stumbles in with two pitchers of chilled wine. Despite her obvious affliction with the lead curse, the changling does not slip on the wine and responds positively to the Valkryie’s line of questions. The molten metal that flows between her teeth doesn’t prevent the drudge from discussing the miseries of her daily life with the warrior angel, and soon the adventurers send the afflicted woman back into the kitchen with an unflattering message for the cook. It’s only a few moments of excited shouting in high pitched elvish before an enormous, obese elf bursts through the kitchen door with a cleaver raised above his head. The chef slips in the wine and is stabbed to death by the Marten from concealment, his molten blood sizzling on the stone walls and floors. The drudge and two elven underchefs press into the doorway, only to be smacked in the faces by the swinging tablecloth bundle of food, dangling from the chandelier, and knocked back into the kitchen with a clatter. The Marten leaps after, knocking the drudge unconscious with a masterful blow, while the rest of the party dices the two chefs as they struggle to rise. A search of the kitchen reveals little of value, only a huge set of cooking equipment and a lot of weirdly prepared dishes (A curly toed shoe wrapped in puff pastry for example). The pantry beyond is filled with fresh vegetables, and ingredients, but dominated by a huge pink cake stuffed with almond paste doves. The adventurers stop only long enough to gather up a few bags of flower before heading West down a flight of stairs from the library into a huge cavern. The cavern is unlit, and feels ancient, a place where only minimal improvements have been made to smooth out the most dangerous sections of the floor. To the North the cave wraps around to another set of stairs that climb up into the entry hallway. A sudden bellow and rattling of chains shocks the party from their investigations, and light shined into the Northern part of the cavern reveals a hulking chained beast, attached to a ring in the wall. The creature is a gorilla-like mass of blue fur and sinewy muscle, with crystalline teeth, claws and eyes – a dreaded Temple Beast. Yet the beast seems saddened, eyes filled with longing and its threatening bellows for effect only. The creature ignores a thrown ration of cheese and meat, but sniffs and gobbles up a chunk of hardtack with obvious glee, and the party decides to placate it with the huge pink cake from the pantry. However, as the band drags the tottering, oversized confection back through the library, the door flies open to reveal a gang of anthropomorphic animals in torn wedding finery. The four rabbits and lizard carry sacks bulging with random palace knick-knacks, and all suffer from minor wounds. As the adventurers attempt to hail them the looters scream, believing them cursed palace dwellers, and an absurd melee commences. It’s over almost as soon as it begins however, with the Valkyrie shouting one of the rabbits into surrender and the others fleeing into the hall. A well placed blow opens the fleeing lizard’s shoulder and slices his loot bag apart, dropping china to shatter on the stone floor. The priest flings a blanket over the head of another rabbit, before the looters flee. Taking pity on their captives the party allows one of the rabbits to dash out the doorway and hires the other as a henchman. Upon returning to the cave and Temple Beast, the adventurers quickly discover that the stomach is the way into a monstrous ogre’s affections, and when freed from its chain the creature bellows a willingness to tag along with the party. Emboldened by the success of their recruiting efforts, the band chooses to investigate the doors in the North of the cavern. The doors are polished wood, each depicting a chalice, pouring stylized streams of water. Beyond the right door is a strange oblong room, filled with murals of cavorting stone nymphs in a cavern setting and wooden cabinets covered with jars of unguents, brass tools and clean towels. A high bed draped in starched linen rests in the chambers middle. Thinking this a gruesome torture chamber, the valkyrie flings open the largest cabinet, crossbow cocked in hand. A strange homunculi of lumpy lavender soap and bronze syringes tries to jab her from within the cabinet, but the warrior fends it off, firing her weapon in reply. The bolt ricochets about, but fails to harm the odd creature, which clambers forth with menacing slashes of its syringe paws. Despite its odd appearance, the soap golem is quickly smashes into a sudsy ruin, and the syringes collected. A small crystal key and a pile of valuable inanimate lavender soap prove to the only items of interest in the spa. A door in the North wall of the spa chamber, a mosaic covered wood panel, opens into a cool bath area, the large tub inset in to floor and everything tiled with small lapis squares. The tubs fixtures are silver, and a set of winged glass pitchers of bath oil sit about the room. As the explorers creep forward cautiously, first one and then all six of the pitchers animate, taking flight on their glass wings, and begin to dart playfully at the party. Deciding that one animated beauty product is more than enough to encounter in one delve the party retreats, closing the door before the bath oil vases decide to attack. Checking the other door from the cavern, the adventurers discover a sauna chamber, worn wooden benches completely lost in pleasantly hot steam. The constant hiss of the steam vents and the lack of visibility cause the explorers to balk, and they turn back into the cavern itself leaving the remainder of the holy spa unexplored. A wide marble staircase, built over an uneven natural stone slope winds down into the darkness from the Southern part of the cavern, and after fifty feet stops in another vaulted natural cavern, it’s roof held up by pillars of crudely carved natural stone. The cavern is an elven earth temple, to a deep goddess, and it’s walls are covered with ancient paintings in blue pigments, including many long fingers elven handprints. A dais of pink marble, the same as the stairs holds a large iron meteor altar, topped with an inverted stone bowl and a set of carved stone candlesticks. The badger priest senses that the chamber is the scene of a battle between earth deities. Blue besieged by yellow, and an intense antipathy towards dwarfs. The cleric climbs the altar with holy water, preparing to bless the bowl, but as he approaches the bowl an ochre serpent, made of clay lashes at his face. The earth snake’s rough tale abrades the face and neck of the priest, but he manages to crush it before it’s rocky fangs find his throat. Feeling that the cleansing of the temple is even more important than before the priest leads the party in a short ritual blessing of all its corners, attempting to bolster the besieged elven goddess, before the band clambers up another set of long stairs in the temple’s Eastern wall. Climbing up a long corridor the party finds the priests barracks, empty except for the bodies of two lead cursed guards and three blue robed elven acolytes. Eventually the corridor loops around to the entrance portcullis, and the explorers return to town with their new wealth and discoveries. An interesting revamping. I think you're right about the correct use of "plot type" elements in exploration game: they should be used to entice the characters to want to find out more. Attraction not coercion. wonderful, in my campaign "goblins" are already talking animals. and I am running two groups in a fey city, so Im sure your insights will come in very handy. thanks.